* Anoushka Shankar is performing at Koerner Hall in Toronto, on Saturday, Nov 23, 2013 at 8:00 pm. Anoushka Shankar received her musical instruction at the feet of her father and the grandmaster of the sitar, Pandit Ravi Shankar who was not just one of the greatest musicians of the Indian sub-continent, but one of the greatest instrumentalists, composers and musical intellects the world has ever seen. But Ms. Shankar played “chela” to her father’s “guru” when she was barely in her teenage years. Two decades and then some; eight recordings later, Ms. Shankar has now released Traces of You possibly the most definitive of her career to date. The music acknowledges the spiritual nature of her relationship with her father—both as her mentor and “guru” as well as her elemental love. Moreover, in music as transcendental as that of this recording, Ms. Shankar also finds a golden thread that connects the love that linked a musical relationship with one that united a family, between father and daughter, mother and son and husband and wife. Also, what Ms. Shankar has done—something truly surprising and breathtaking as well—is to create shorter pieces out of a music that was conceived in a tradition that dates back thousands of years and yet it is modern, for her music forms a continuum with that tradition, culled from ragas that take flight at sunrise or sunset; in light and in darkness; in joy and in the elemental ache of melancholia. No other musician—except Pandit Ravi Shankar, who recorded the legendary Living Room Sessions – Parts 1 and 2 inventing and creating new ragas in the process. It is fitting to speak of Anoushka Shankar in the same breath as of her father as the proverbial mantle appears to have been passed on from father to daughter, at least this is the exquisite evidence on the recording Traces of You. Ms. Shankar is a fine young sitarist. She plays with great sensitivity and emotion, bending and twisting notes so that they pirouette like the dancers that spin around in interminable circles. Sometimes they leap from the great globe of the sitar and bolt like excited impalas as they ascend into the infinite blue. Even when she suggests an elemental ache, as she and her sister and vocalist, Norah Jones do in “The Sun Won’t Set” this is a fleeting sentiment, followed by as if by the tail of a comet, by a wave of hope. In this aspect, even a sad piece triumphs ultimately as one which is full of great expectation—in this case, awash with the rays of the undying sun. Ms. Shankar also displays a fine sense and use of a tonal palette, featuring an array of colours as beautiful as they are arranged in a myriad array. Her ability to manipulate the radiant and ductile tonal textures of the sitar and to draw from that ancient instrument, vivid sounds that light up the timbre of her ancestral instrument. This shows Ms. Shankar to be an extremely erudite practitioner of Hindustani music and capable of doing something her late father started—to bring its improbable melodic devices into a modern era. Here she goes much further in melting the borders that separate not just Hindustani Classical music—both ancient and modern—but the borders that separate Eastern and Western music as well. In this regard, she is in vaunted company. First there is her half-sister, the now famous Norah Jones, who shares her ethereal voice with the sitar, on three charts. On the first, “The Sun Won’t Set” Ms. Jones is the one who blurs the lines between the two musics just as much as does Anoushka Shankar. Fortuitously Ms. Jones is invited to turn the most soulful tribute to their father (“Traces of You”) into one that is deeply spiritual; with both musicians reaching deep into their souls to make the music as meaningful and as leaden with sentiment. And finally on “Unsaid” the sisters make that achingly beautiful ballad pierce the heart like a proverbial arrow. 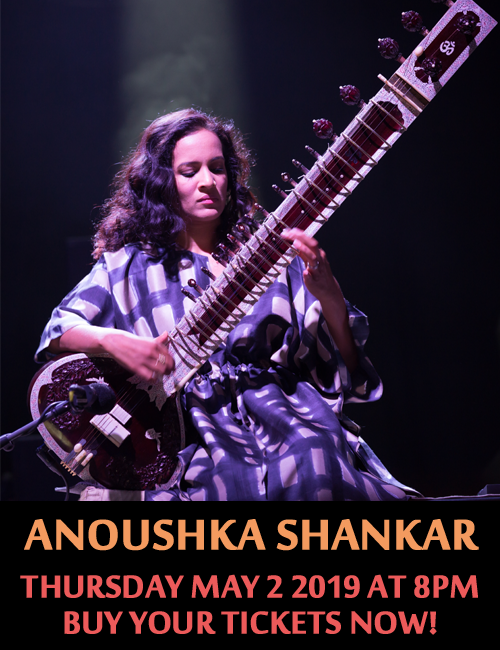 Ms. Jones’ whimsical vocals are simply perfect for the lyrics as is Anoushka Shankar’s tawny notes that weave their magic into the beautiful music. Anoushka Shankar also has a wonderful ensemble—apart from her sister, that is—and they include the wonderful multi-instrumentalist Nitin Sawhney, who produced this record. Mr. Sawhney plays guitar, bass and piano as well as programs the strings that provide a swell of beautiful orchestrations when the music demands it. His presence can be felt throughout the album, from “Indian Summer” to “Chasing Shade”. The remarkable percussionists range from the Austrian Hang player, Manu Delago to the tabla player who accompanied Pandit Ravi Shankar’s last sessions—Tanmoy Bose. But Ms. Shankar also invites the sensational Carnatic percussionist, Pirashanna Thevarajah to sit in on several pieces and he does not disappoint. Classic performances are on “Maya,” the uplifting “Lasya” and the absolutely radiant “In Jyoti’s Name” where Ms. Shankar’s virtuosity shines in her spectacular “jugalbandhi” with Mr. Thevarajah. Other absolutely memorable pieces are “Lasya” the vivid narrative “Monsoon” that unfolds like the soundtrack of a movie and “River Pulse”. But despite the unbridled ingenuity of each of the individual musicians on this recording, it is time for the spotlight to be on Anoushka Shankar, who seems to have arrived in fine form. Like a musical chameleon, Ms. Shankar turns exquisite colours from “Lasya” and “Monsoon” to “Traces of You”. In all of her spectacular turns, Ms. Shankar shines brilliantly—something that would surely not be lost on her great father, Pandit Ravi Shankar. Track List: The Sun Won’t Set (featuring Norah Jones); Flight; Indian Summer; Maya; Lasya; Fathers; Metamorphosis; In Jyoti’s Name; Monsoon; Traces of You (featuring Norah Jones); River Pulse; Chasing Shade; Unsaid (featuring Norah Jones). Personnel: Anoushka Shankar: sitar, vocals (7); Norah Jones: vocals (1, 10, 13); Nitin Sawhney: piano (3, 6), programming (3, 4, 6, 7, 9, 10, 11), guitar (1, 10, 11), string arrangement (2), bass guitar (7, 10), ukulele (10); Manu Delago: hang (2, 4, 5), glockenspiel (10); Ian Burdge: cello (2, 4, 11); Tanmoy Bose: tabla (7, 10); Pirashanna Thevarajah: ghatam (1, 8, 11, 12), mridangam (12), morsing, vocals (5, 8), shakers (11), kanjira (12); Bernhard Schilmpelsberger: udu (5); Kenji Ota: tanpura (5, 7, 8, 9); Anil Narsimha: vocals (7); Sandhya Chandrachood: vocals (7); Sanjeev Shankar: shenai (7, 12); Aref Durvesh: tabla (12); Ravichandra Kulur: bansuri (12).